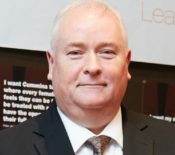 Peter Jensen-Muir joined Male Champions of Change National est 2017 group in 2018. Peter Jensen-Muir joined Cummins in 1988 in Melbourne, Australia and over the ensuing 30 years has had assignments in Australia, the United States, Singapore and the United Kingdom where he was engaged in supporting customers in industries covering Automotive, Mining, Power Generation, Rail and Marine sectors. Since 2013, Peter has been responsible for providing leadership as Executive Managing Director for Cummins Asia Pacific, overseeing the Company’s operations and ensuring that Cummins lives its values of integrity, diversity & Inclusion, Caring, Excellence and Teamwork in delivering on its customer, community, financial and operating commitments across a diverse region including Australia, New Zealand, Papua New Guinea, South Asia, South East Asia, Pacific Islands, Korea and Japan.